I was pretty flattered when Mark Frauenfleder asked me to contribute a pearl of wisdom to the “Tips From my Favorite Bloggers” chapter of his newest book, Rule The Web . And I’m really glad that he did, because as much as I admire Mark for his perspective, interests, experience and tastes, the truth is I may never have gotten around to buying Rule The Web otherwise, which would have been too bad for me. I’m also glad that I brought this book along with me to a two-day beach getaway, where I thankfully did not have access to the internet. You see ironically, being marooned without the web allowed me to read the book cover-to-cover, rather than just skim and browse as I would normally do with a book of this format – therby getting more out of the book. Had I been near a computer, I would have been sidetracked every 2 minutes checking out some neat web service or resource that I had no idea even existed. Rule the Web is not a directory of sites, although it does talk about many sites, nor is it an in-depth look at any one aspect of using the Web. It’s more like one big magical advice column that answers all your questions about what you could be doing with the web to make your days easier, more productive and fun, but without you even having to ask them. Mark is a DIY guy who spends a lot of time on the web trying out cool new ways to search, organize, store, share, refine, publish, work, streamline, read, fine-tune and enjoy by way of the web. With this book, you get to harvest all the sweet fruits of Mark’s tireless experimentation without the painfull pitfalls and annoying dead-ends. The advice is wide-ranging, and always right on target. 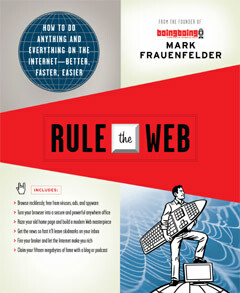 This book is a great read for anyone who uses the web at all (or aspires to), and who doesn’t? Whether you fancy yourself a blog-publishing, podcasting guru, or a newbie you will learn a ton from this dense jewel. Buy from Amazon . For ongoing tips, check out the companion Rule the Web blog. This entry was posted on Wednesday, June 27th, 2007 at 10:46 pm	and is filed under Reviews. You can follow any responses to this entry through the RSS 2.0 feed. Both comments and pings are currently closed. Very cool Fink. What interesting to me is the cover of the book is so your style. I sure hope the Tacoma Public Library acquires this book soon. I would just like our take on the white orchid project I am running, thats all. Reading your blog, I just like some of the things I read and wanted your opinion. I’ll have to force myself to read it all the way through without stopping to look something up online. Thanks very much for your contribution to the book — it was really helpful to me. Tabs and Lyrics, your one stop music resource! 100′s of new songs are added weekly. All guitar tabs, guitar chords, bass tabs, drum tabs and lyrics. I would recommend http://youtubeconverter.info/ to convert and save any youtube video. This is an awesome service offered free of cost! Students struggling to do their biology homework. Our biology homework help online helps you all your biology homework questions, biology problems and biology topics. Our biology homework help online helps you all your biology homework questions, biology problems and biology topics. We are an online Biology homework help site providing 24/7 customized help with your assignment and homework needs.